Solder Copper Tubing in Seconds | Clean Copper + Heat = Success! You solder copper in seconds if you have clean copper, plenty of heat, some flux and no-lead solder. Heat the tubing and fitting enough so the solder melts with the torch away from the tubing and fitting. You solder copper using a propane torch, flux and no-lead solder. You can use a torch that has mapp gas or even acetylene. Plumbers use acetylene because it burns hotter and they can get more work done faster. You must clean the copper you intend to solder. Use abrasive cloth or plumber's sandpaper to make the copper look bright. A special round wire brush cleans the inside of copper tubing fittings. CLICK HERE to get FREE & FAST BIDS from local plumbers if you're too timid to try to solder yourself. Mix up the solder flux or paste in case it has separated. Take the solder paste brush and apply the solder flux onto the pipe and inside the fitting. Assemble the parts to be soldered and heat up the torch. Acetylene or propane soldering torches work great. Apply the torch to the joints for about ten seconds. Once the joint is hot, remove the torch and touch the solder to the joint. The heat in the pipes should be enough to make the solder flow into and around the joint. If the solder doesn't melt after touching it to the copper for two seconds, pull the solder away and re-heat the tubing and fitting with the torch for an additional ten seconds. Once finished, use a rag to clean up the joint. Be sure to remove any excessive flux. 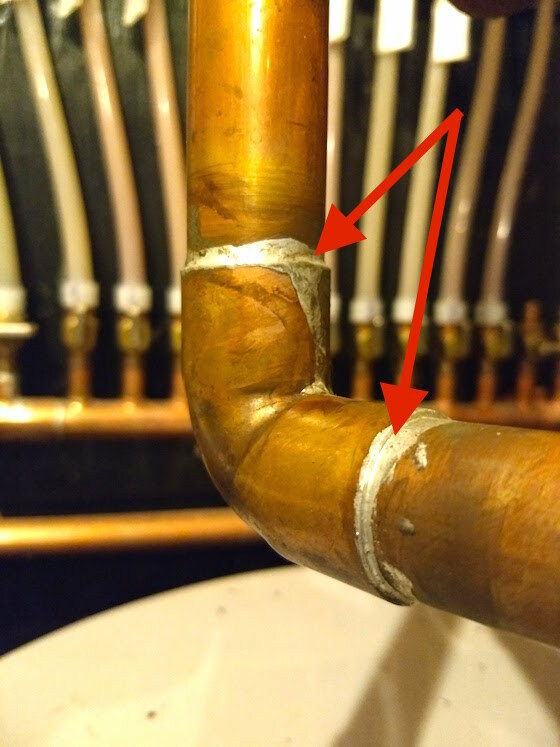 Flux left on copper will corrode the pipe and cause a water leak. Thank you for sharing your copper pipe soldering video. My issue has always been how to solder the next joint without undoing the previously soldered connection. Perhaps you can address that sometime please? William, if you're soldering multiple joints that are near one another, the solder may liquify in one of the joints, but when the pipe and fittings cool, all will be well. If it's an OLD joint, I always wire brush the rim of the fitting to remove oxidation. I may put a light coat of flux on it. Then I solder what I need to do nearby. IF I don't feel confident about the old joint, then I'll touch it with some new solder to give it a new lease on life if you know what I mean. The trick is to get the old joint READY for solder SHOULD you decide to add it. You need to do that before you heat anything up. What's the easy way to do leak-proof vertical soldering? Soldering a fitting on the top of a vertical copper pipe? Thanks, Tim! The same way I show in the video. The solder will flow UP because of capillary attraction. Another nicely done video, Tim. I've never know about brushing clean the ends of the fitting. I've not done a lot of copper soldering but do like to have that rag wet, a quick swipe and excess solder is gone slick and smooth.